In the late 1800s and early 1900s it was believed by many that northern caribou were on the verge of extinction. The Canadian Government made several attempts at solving this problem by establishing reindeer herds in the north. The most famous reindeer herd was established in the 1930s in the Mackenzie Delta yet decades prior to this an attempt was made to start a herd south of Great Slave Lake. In 1907, the Canadian Government sponsored an experiment to import 300 reindeer from Norway to St. Anthony, Newfoundland. By 1910 this herd had increased to over 1200 animals and the decision was made to move part of the herd to the Northwest Territories. Nathaniel Gear, the Chief Herder with the St. Anthony herd, along with Billy McNeill and John Broomfield as assistant herders, were given the job of moving fifty reindeer from Newfoundland to Fort Smith (map). Beginning early in September of 1911 these fifty reindeer were moved by ship, railway, wagon and scow finally arriving in Fort Smith May 20th 1912. Nineteen animals died along the way. 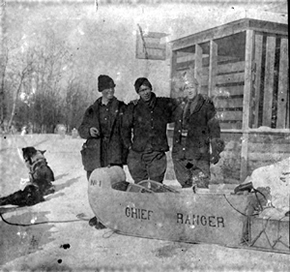 Billy McNeill, who became the first Chief Ranger for the Wood Buffal National Park, was put in charge of caring for the remaining 31 reindeer but over the summer and following winter 28 more animals either escaped into the bush or were killed by dogs. In the spring of 1913 only three reindeer remained and they were all does. Without stags Billy McNeill was ordered to take the remaining three animals to Waite Island in the North Arm of Great Slave Lake and there he was to capture a bull caribou that could breed with the female reindeer. On the way to Waite Island another reindeer died and McNeill spent the winter taking care of the remaining two.